Asus is keen on promoting the merits of its 5-way optimisation present on Z97 and, now, X99 motherboards. The five parameters include EPU, TPU, DIGI+ Power, Fan Expert 3, and Turbo App, with the latter being newest. 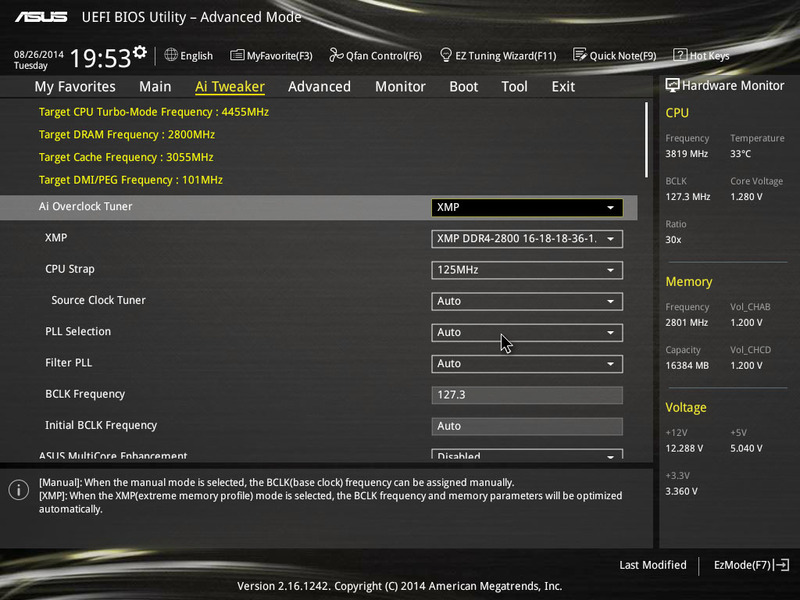 The X99-Deluxe's BIOS is generally very close to the Z97A's we reviewed recently. 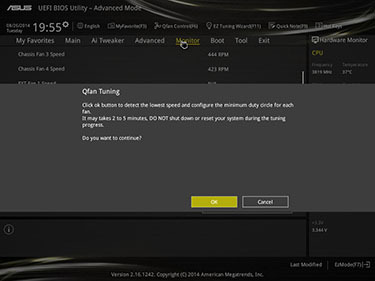 This means a full-UEFI implementation that defaults on entry to an EZ Mode, which spells out all the pertinent details in an easy-to-understand manner. 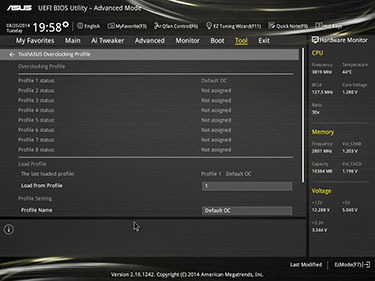 Asus uses a 1,024x768 display instead of the full-HD adopted by the latest Gigabyte boards, and the resolution difference shows. That said, mouse movements are consistent and keyboard presses instant. 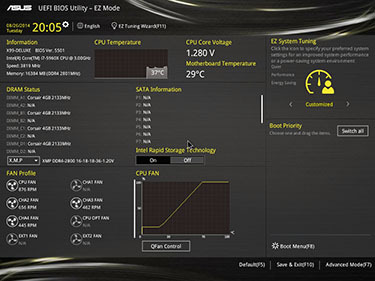 There's real-time feedback on CPU and motherboard temperature, voltage, memory configuration, and storage support. We like it, as it also shows how you've configured the fan-speed control - more on this in a moment - and provides a very simple means by which to overclock the system. Pressing F7 enables the advanced mode functions to be accessed. 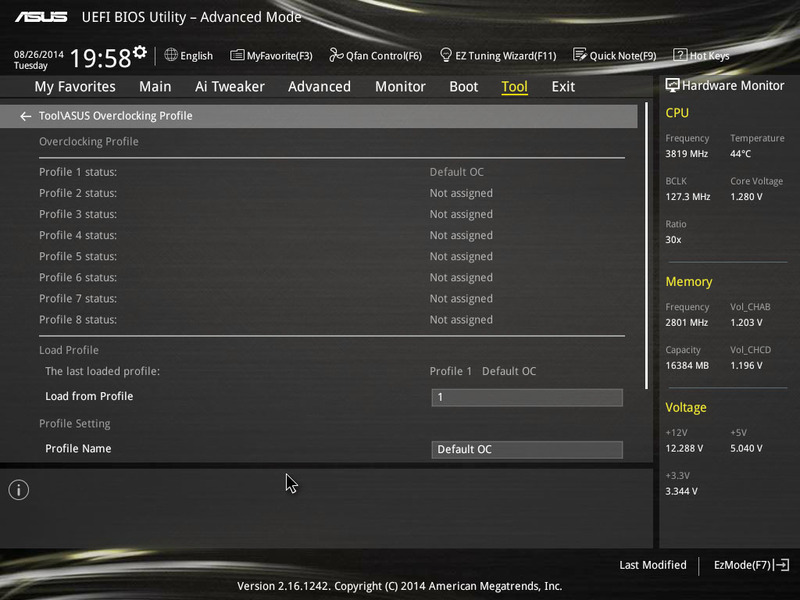 There's an overload of available options, and to Asus' credit, moving up and down the list is smooth and very responsive - it feels like an old-school BIOS in terms of speed, which is something we cannot say about all UEFI implementations. Asus enables any sub-option to be put into a favourites list, because most users only toggle so many functions, and this approach saves time and bother. 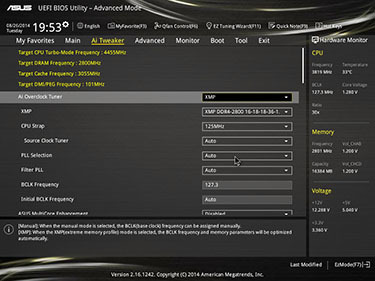 Of particular interest to enthusiasts is the automatic setting of DDR4 XMP modules' timings, though this has a knock-on effect on the base clock and CPU strap. 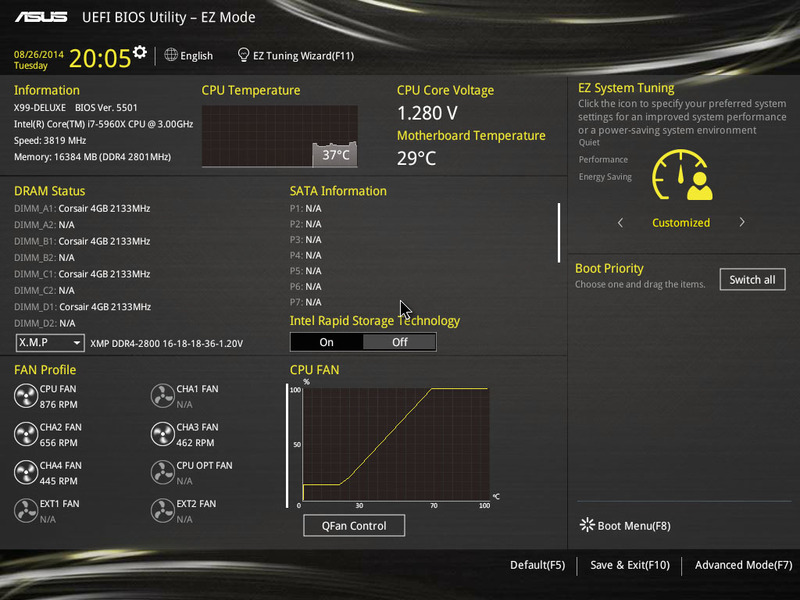 We're happy to see that automatic core overclocking - Asus MultiCore Enhancement - can now be disabled and each core be set to a particular multiplier. It's worth knowing that the lowest multiplier places a limit on how high the chip can run, so inputting 32x on a 6-core limit, for example, means the speed is capped at that frequency no matter how many cores are active, even if 1- or 2-core parameters are set to 36x. There are a further 15 or so voltage choices below the options in the top-right picture, providing enough leeway to run an undervolted, ultra-quiet PC or, conversely, enough voltage to require LN2-type cooling. Good BIOSes have good fan control. 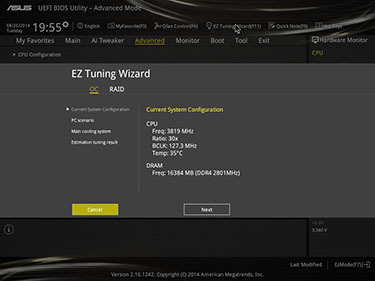 Asus carries over the solid work from Z97 by having all connected fans' speed modulated by either PWM or DC, so both 3- and 4-pin fans are covered. 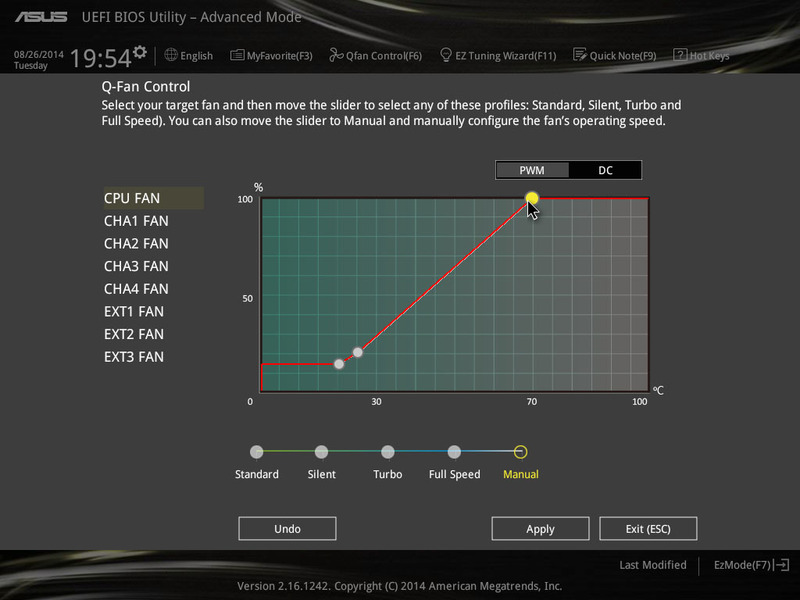 You can drag the slider and control the fan speed with above-average granularity. 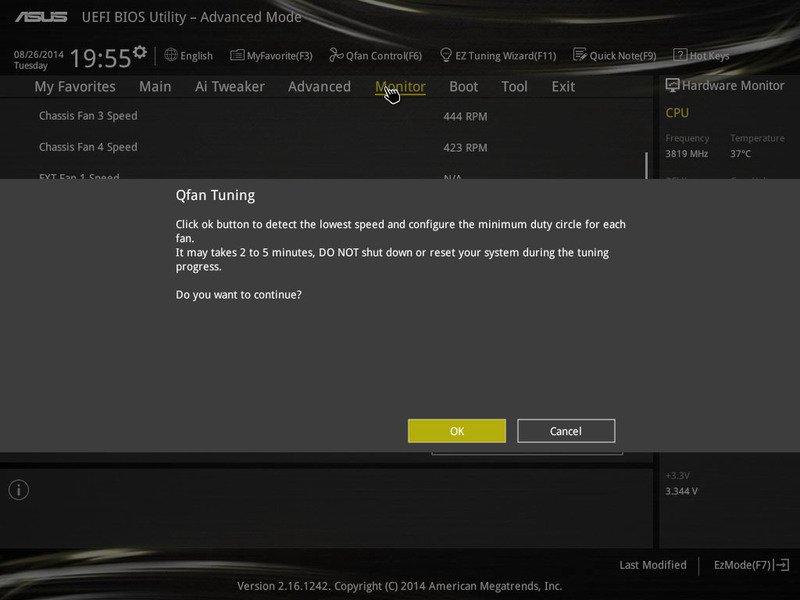 Those wanting an ultra-quiet system would do well to go into the Qfan Tuning tab. 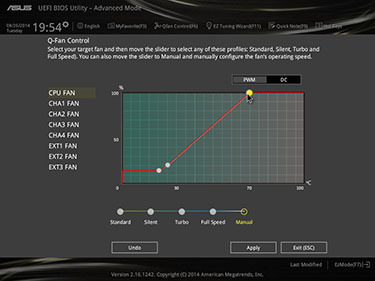 Here, the BIOS calculates the slowest speed that each fan can run, and, after a few minutes, shows the results in the fuller fan-control section. Once done and saved to the BIOS, our X99 system, housed in a Corsair Graphite 600T, becomes eerily (and surprisingly) quiet under load. If you excuse the pun, we're fans of how Asus controls, well, the fans on the board. 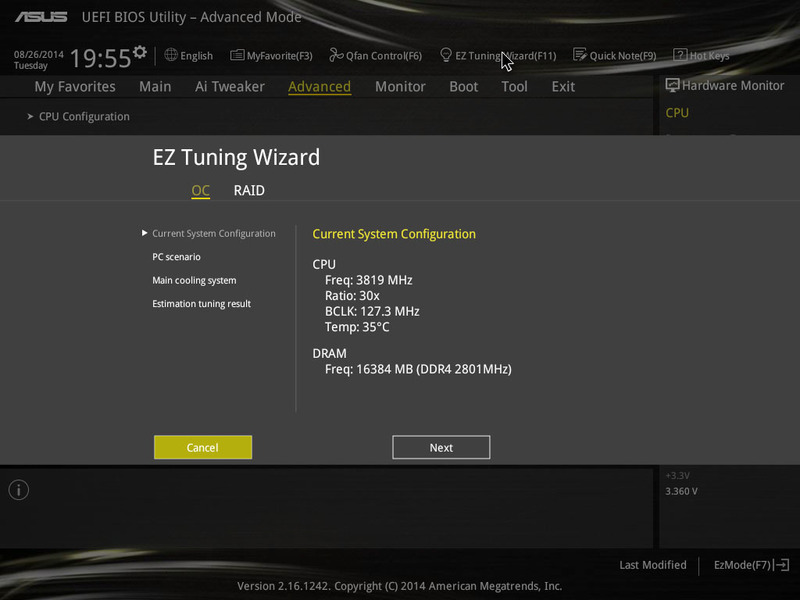 Finishing it off, folks who don't want to be mired in BIOS minutiae can opt for the EZ Tuning Wizard. Asking basic questions such as the kind of PC you're using - home, office, etc. - and what type of cooling you have in place, the board automatically overclocks the system to within 10 per cent of what we managed when done manually. Building on the good of the Z97 BIOSes, the X99 version is leagues better than that found on the previous premier chipset, X79.